Tamil New Year or Varsha Pirappu or Tamil Puthandu is celebrated in the Chithirai, the first month of the Tamil calendar. Every year it falls on April 14 th. It is most important festival for Tamilians. 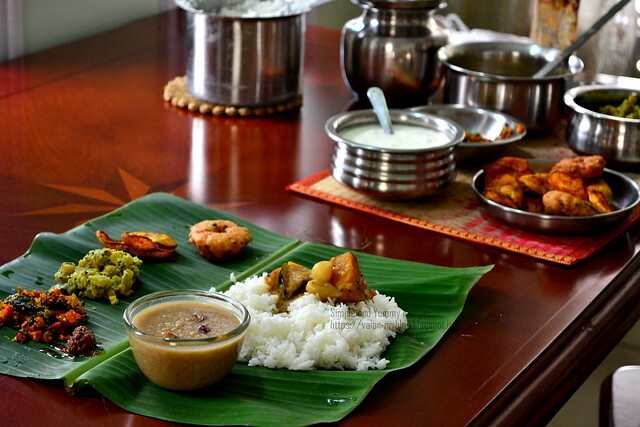 On this day we wear new clothes and go to temple and we cook an elaborate meal for lunch on this festival day. We make sambar, kootu, poriyal, vada and payasam on this day. 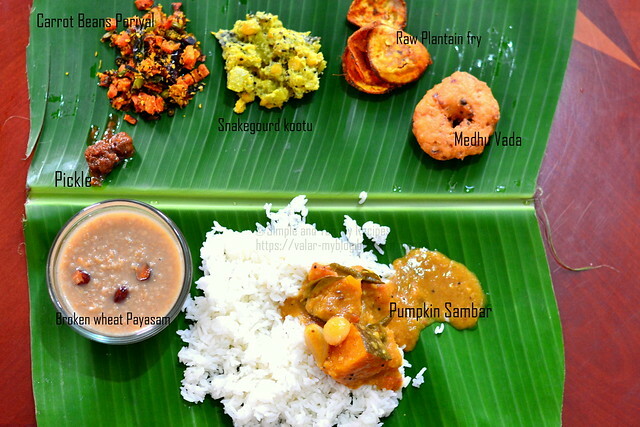 We serve this food on banana leaf. 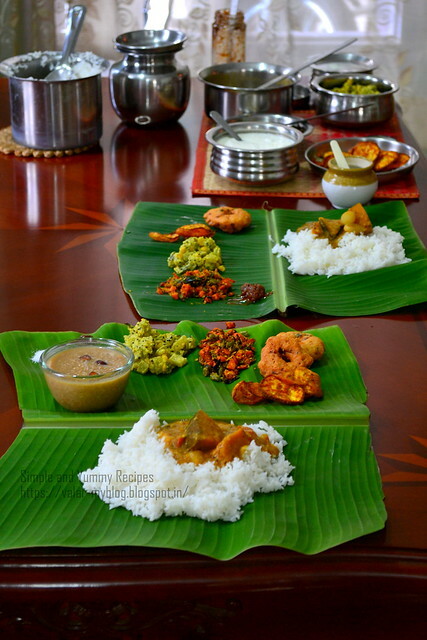 So here is the simple Tamil New Year Lunch Recipes. Scroll down for the recipes and also you can click the links for detailed recipes of each post. Wash and soak toor dhal with 2 cups of water for 20 min's and then transfer it to the pressure cooker. Add 2 drops of castor oil and pressure cook for 2 or 3 whistles. Heat oil in a deep pan, add fenugreek, cumin and mustard seeds and allow them to splutter. Next add asafoetida to it. Then add dry chillies and saute. Then add the shallots, curry leaves and fry till it turns pink in color. Add the chopped tomatoes to it and cook till it becomes soft. Add the cooked dal and drumstick with 1 cup of water to it and bring it to a boil. Add sambar powder, chilly powder, tamarind pulp and salt and cook till the drumsticks are done, say about for 10 to 15 Min's. Soak the chana dal/split bengal gram in water for 15 to 30 Min's. Wash the snake gourd and split open and remove the seeds and chop them into small pieces and keep. Cook the dhal by adding enough water and pinch of turmeric powder,when its 3/4th cooked remove from the flame. Heat oil in a wok/kadai, when hot add mustard seeds and allow it to splutter. Add curry leaves and fry for 3 seconds. Then add the chopped snake gourd pieces and dhal to it and cover and cook till its 3/4th done. Next add the ground paste and cook till the raw smell goes off, between stir once and add salt to it and mix well. Serve with rice and sambhar/rasam. Wash and peel the skin and cut the raw plantain into thin rounds. In a bowl mix chilly powder, turmeric powder, rice flour, salt with little water and make a paste. Add the plantain slices to the bowl and mix well so that the paste coats well to the slices and keep aside for 10 Min's. Heat oil in a wok and deep fry the plantain slices till it turns brown and crispy. 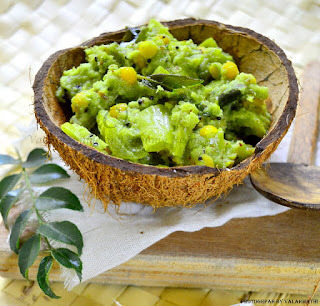 Serve with rice and sambar/dal/rasam/curd. Heat oil in a kadai, when hot add channa dal and mustard seeds and allow it to crackle. Then add onions and fry till it becomes light golden brown in colour. Add the carrot and beans to it and cook for 2 minutes. When the carrot and beans gets cooked, add the grated coconut to it and give a good mix and cook for one minute. 1. Wash and soak the broken wheat for half an hour. 2. Pressure cook the broken wheat with 1 1/2 cups of water for 5 to 7 whistles. 3. When the pressure is released completely, open the cooker and add the jaggery and mix well. 4. Stir continuously until the jaggery is melted and combined. 5. Add the milk and give a good stir and switch off the flame. 6. Heat ghee in a small frying pan and add the coconut pieces and then cashew nuts, raisins and cardamom and fry it. 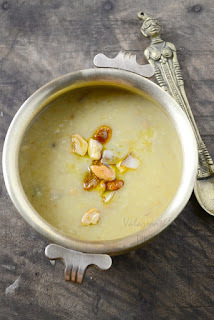 As payasam tends to thicken as it cools you have to serve it immediately. Suppose if it cools down or if you want it to serve later, add the warm milk before serving. You can either decrease or increase the amount of dried fruits to be added. Before adding the jaggery, make sure the broken wheat is completely cooked. Once you add in the jaggery it will not cook. transfer the batter to a bowl. Then add onion, green chillies, curry leaves, salt, cumin seeds, peppercorns to it an mix well. Tips: After soaking, drain the water and keep in the refrigerator for 1 hour and then grind it, so that you can make the round shape easily. 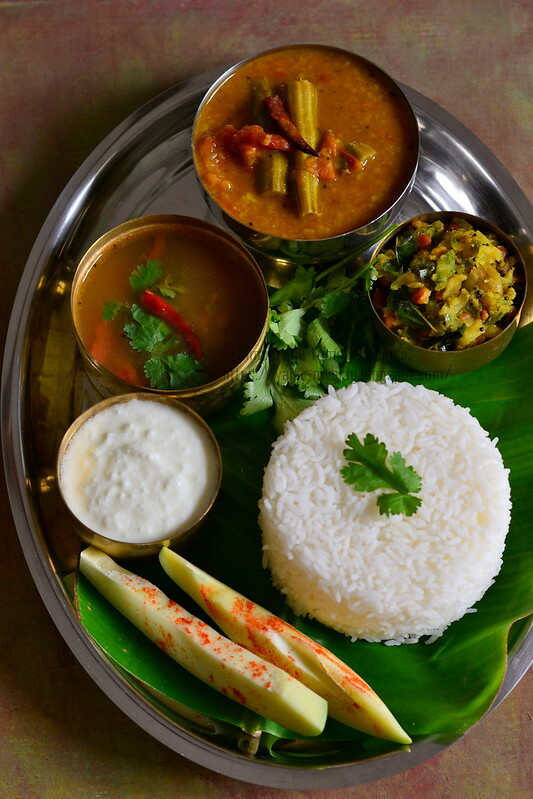 Hyderabadi Chicken Curry - A delicious and famous chicken curry from Hyderabadi cuisine. 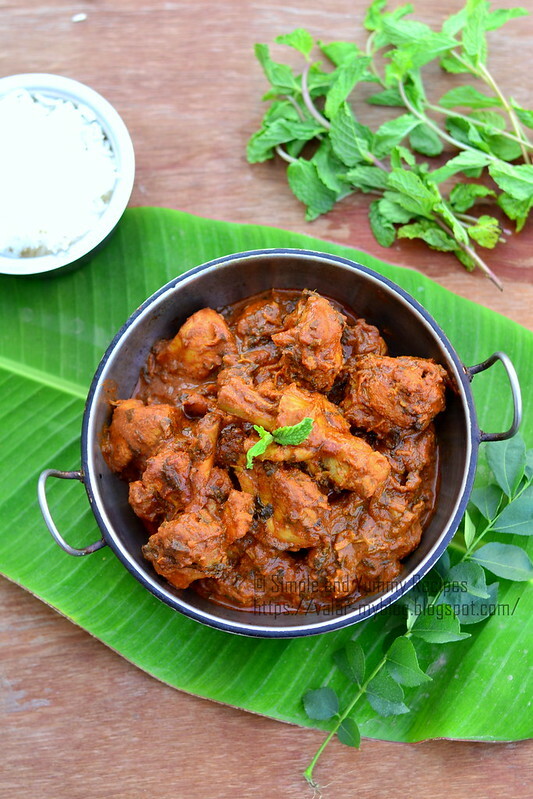 It is a simple and easy chicken curry from the Hyderabad region of India. 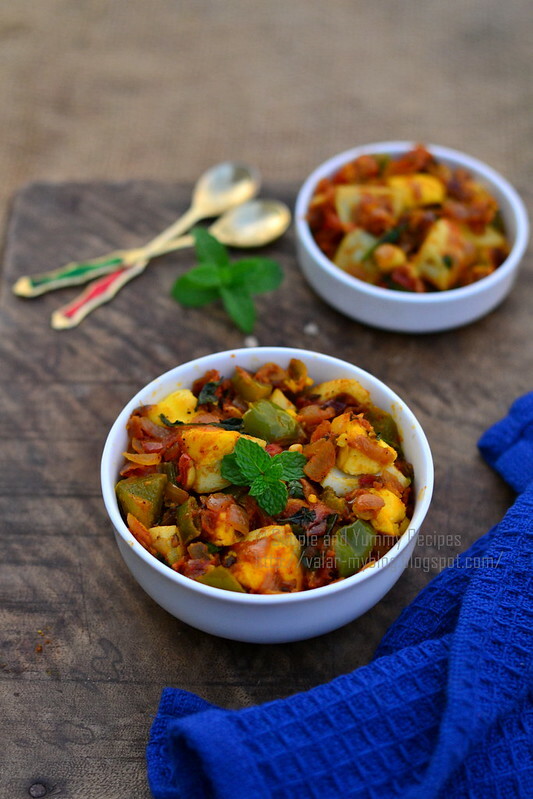 A very very easy and quick starter recipe with paneer. It is perfect for get together and parties 🎊. 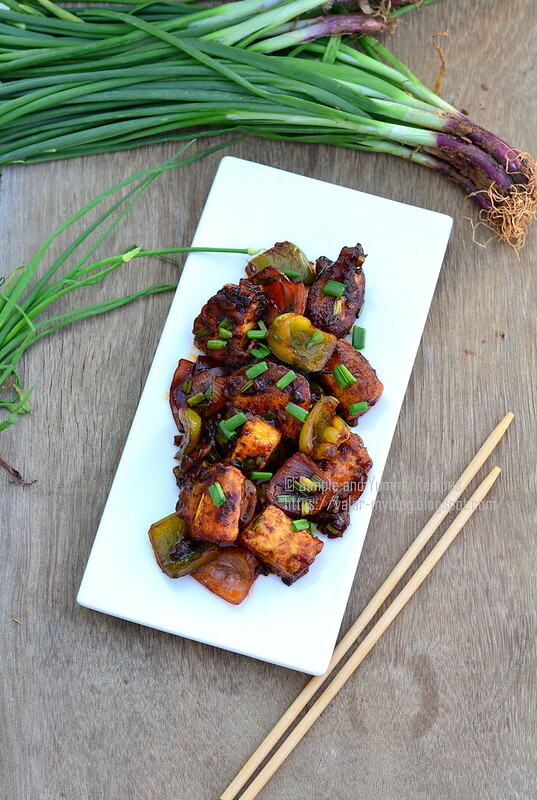 and it requires very less cooking time.... Also can be served as a side dish for fried rice and noodles. Boiled Egg and Capsicum Bhurji | Boiled Egg Bhaaji | anda Bhaaji - is a simple scrambled egg recipe made with hard boiled eggs , onion, capsicum, tomatoes and little spices. Do you usually prepare egg bhurji by scrambling eggs ? Do try this different version of egg bhurji using boiled eggs. 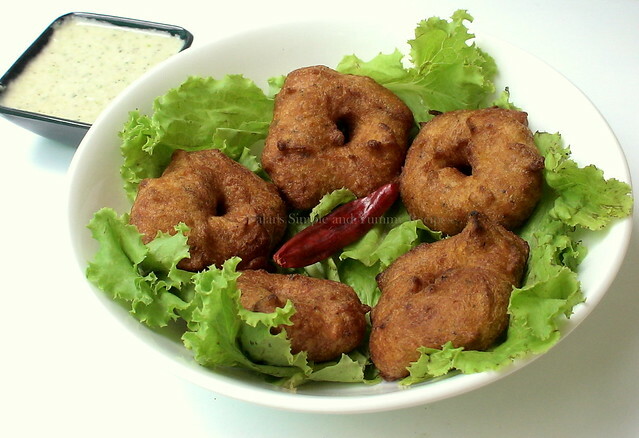 It is made with hard boiled eggs along with capsicum and spices giving a nice zing to the dish. It is a very easy and simple egg recipe that can be prepared quickly for morning breakfast to have with bread or you can have it with chappathis for dinner.